If you just love building custom furniture furnishings out of pallets then why not build the wooden gates also out of pallets? Pallet door and custom security gate ideas are also a big hit over the internet and today we have picked this DIY pallet gate with cut out house number as an outstanding inspiration for the creativity lovers! It shows you all then how the pallet slats can be intermingled to boost the security of your living spaces! Here 4 straight and beefy wooden pallet lengths have been put together and has been tightly fixed in place by installing the back Z-shape supports, so finally the entire wooden board has been installed to primary access point to home as a gate! For installation, the lasting metal hinges have been that allow the door to spin in a super smooth way! 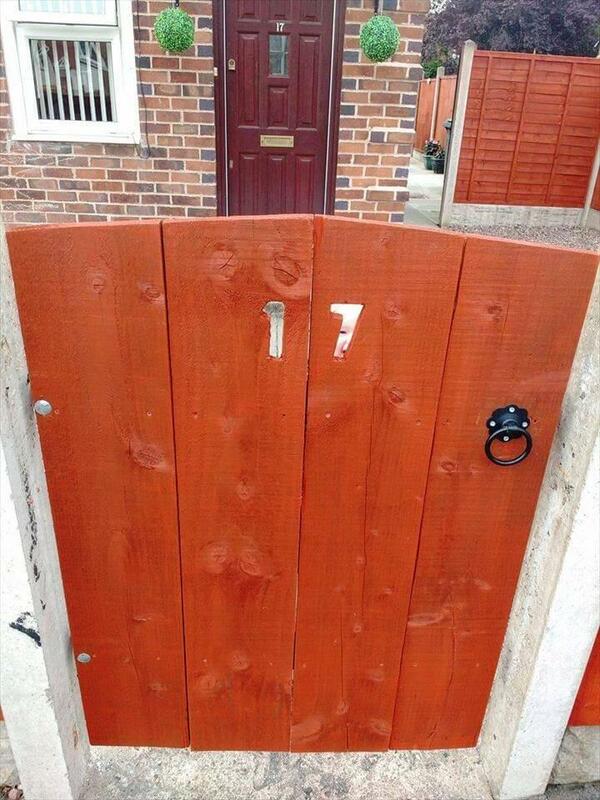 An antique lock system has also been installed that help will not let the gate be opened without permission! 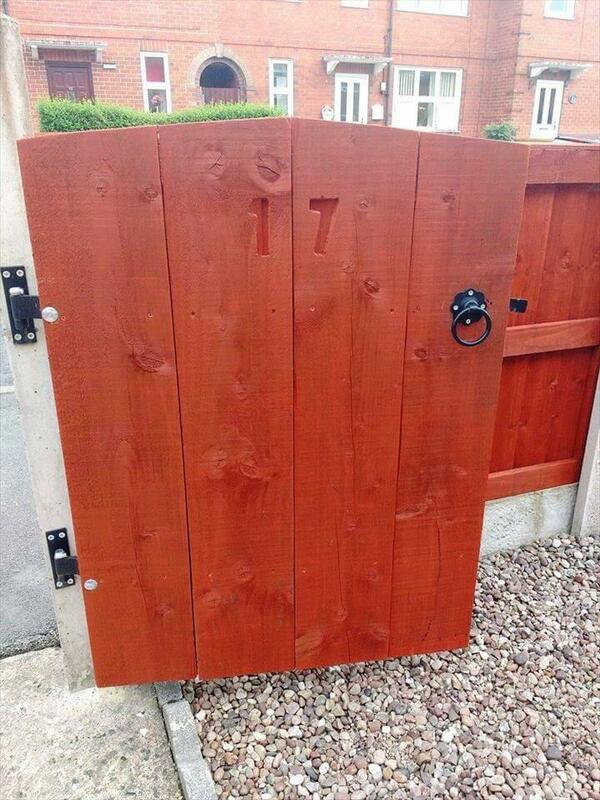 Finally the gate has been gained in a light brown wooden look by applying respective stain coats and has been finished by the cutting the house number out, sharp wood cutting tools or a carving router may come in handy to do this! An antique handle painted in black has also fixed to outside will help to open gate easily! 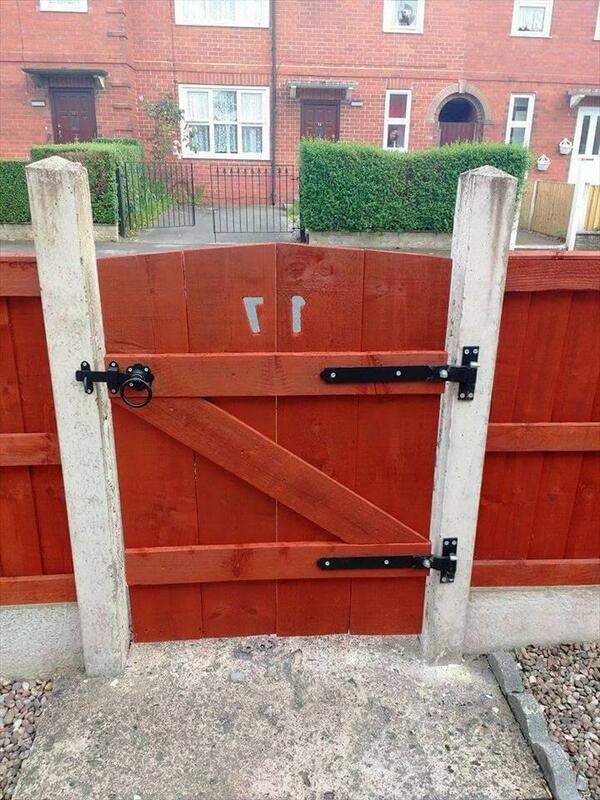 There may be several different options while choosing the hardware for the gate! Large black painted antique hinges have also been hired here for smoother spin of the gate, hinges have been fixed to wall area with screws while to door with both nut and bolts and also with screws! Just like the custom house number cut outs. The gate can also be personalized with owner’s name letter cut outs or other accent or patterned cut outs!